Shopping around for a 4K monitor for your PC gaming needs, but don't need the bells and whistles of more expensive models? Samsung may have just the display series for you. 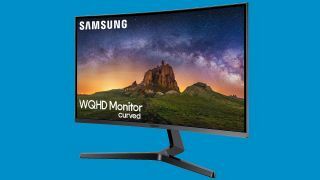 Samsung's CJG5 screens, available in 32 and 27 inch sizes, eschew the more dramatic accoutrements of some gaming monitors in favour of focussing on the essentials to improve your gaming experience. So, rather than LED light arrays that'd make Jean Michel Jarre blush or screens so wide you'd need to evolve new sets of eyes to appreciate them, it goes for a solid 16:9 / 2560 x 1440 ratio and resolution set up on the 144Hz VA display. Samsung's quantum dot tech is nowhere to be seen. In terms of ports and inputs, it's kept simple too. You get two HDMI connections, one compatible with HDMI 2.0, a DisplayPort 1.2 port and a jack for plugging your headphones directly into the screen. It's only flourish is the fact that the screens use a curved display, which Samsung believes makes them easy for your eyes to focus on during long play sessions. Pricing and availability are to be confirmed. But given the essentials-only nature of the spec sheet, and the fact that Samsung describes the line as "reasonable and affordable", it seems you can rest assured that they won't break the back.